Our Penang cruise port guide gives you information about the docking location, cruise dock, transportation options and much more! This is the Swettenham cruise pier in Georgetown – Penang. This is where your cruise ship will arrive. The building on the pier is the cruise terminal where you will find limited facilities. Directly in front of the cruise terminal is where you will find the city centre of Georgetown. The cruise taxi prices are on display in the cruise terminal. 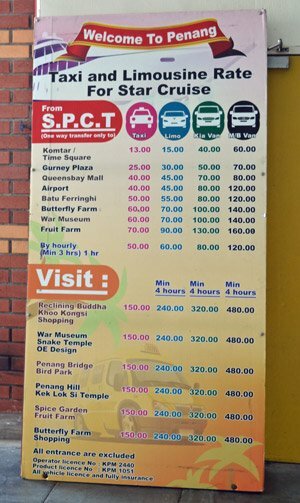 Check out the rates before negotiating a fare with the taxi driver! This is the exit of the Penang cruise terminal. From here you walk straight into the city centre. Find taxis just in front of the exit and public transport at the cruise terminal exit at the left hand side. 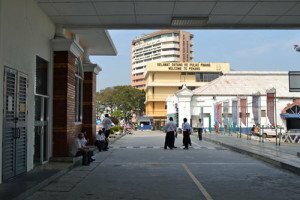 Welcome to the Georgetown – Penang cruise port guide. Georgetown is the capital city of the island of Penang. 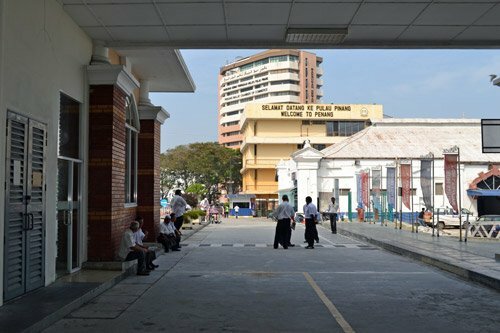 Penang is a state of Malaysia. It is listed as a World Heritage Site by UNESCO. The old city offers a great combination of Chinese en Muslim influences. You will find the old town is filled with colonial buildings, Chinese shop-houses and various religious shrines. 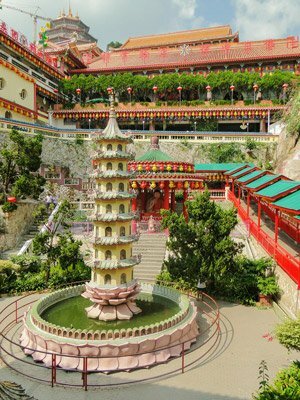 Out of town you will also find spectacular attractions like Penang Hill, the funicular train and the incredible Kek Lok Si Temple. 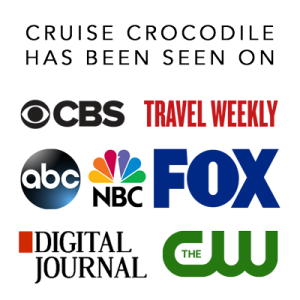 Your cruise ship will dock or tender to the Swettenham pier. At the cruise pier you will find the cruise terminal which has facilities to welcome large ferries. 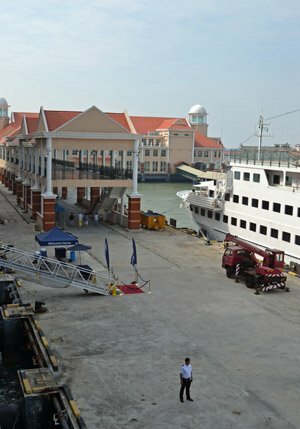 The Penang cruise dock and cruise terminal is located right in front of the city centre of Georgetown. Please note that Georgetown has rather under developed footpaths. Some streets do not have footpaths at all. Pedestrians should be advised to pay attention to traffic when walking through the city. Alternatively to taxis you can also go around by trishaw. This is a great way to get to nearby places in town. Negotiate a price before you head off. Expect to pay between 35 and 50 RM per hour. The local transportation in Georgetown is rather good. Komtar is the main bus station (see marked in the map above). From here you can take buses all over the island. Bus line 201, 204 stops near the exit of the cruise terminal. Catch one of these busses to go to Penang Hill and Kek Lok Si Temple. There is no wi-fi available at the cruise port. However you can find lots of coffee places in town to connect to wi-fi when you buy a cup of coffee. Try white coffee at church street of Subway for example. Cruise ships dock at the Swettenham pier in Georgetown, Penang. This cruise dock offers a cruise terminal with several facilities and is located close to the city center of Georgetown. Read the full Penang cruise port guide to know all about what to see and do in port.